Sweating is nature’s way of regulating your body temperature. Hyperhidrosis is a condition that causes sweating excessively beyond what is required to regulate body temperature. The condition may cause avoidance of certain activities or socializing due to the embarrassment or anxiety it may cause. Excess sweating may occur over the entire body or in just certain areas such as the underarms, face, soles of the feet and palms of the hands. If your episodes of hyperhidrosis only affect your feet and hands, you may typically have only one occurrence per week, and during the hours that you’re awake. 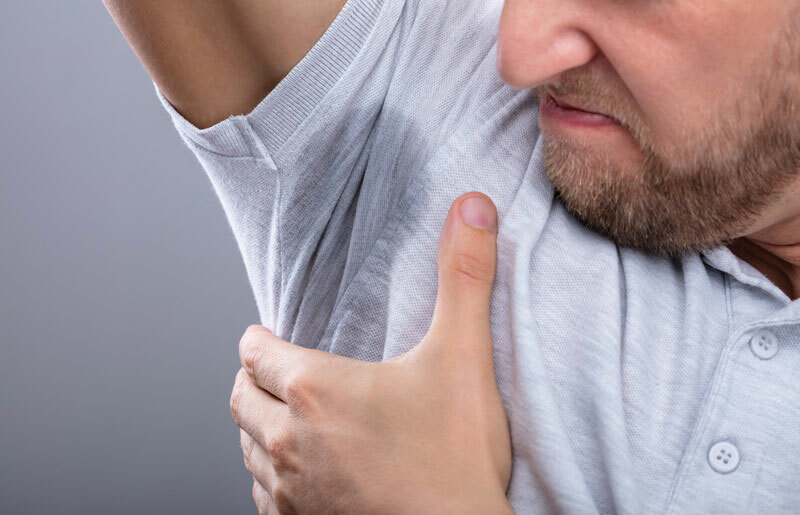 Primary hyperhidrosis is a type of excess sweating that has no particular medical cause. In this type of excess sweating, your sweat glands are triggered by the nerves and is likely hereditary. Secondary hyperhidrosis is caused by a medical or health condition. The possible causes are many but include diabetes, anxiety disorder, heat exhaustion, overactive thyroid glands and menopause. Fortunately, there are some readily available natural remedies that can produce great results, helping to control hyperhidrosis and improve your quality of life. Lemon – Apply lemon to the affected areas before you go to bed at night. Apple Cider Vinegar – Mix with a small amount of water and apply to affected areas. Witch Hazel – This is another great remedy. Simply apply to the affected areas. Black Tea – This type of tea contains tannic acid that can help reduce sweating. Simply place a tea bag in warm water to soak for a few minutes and then use the tea on your hands and feet – or use the teabags for your underarms. Coconut Oil – A popular remedy for many conditions of the skin, coconut oil is also very effective in reducing excess sweating. Rub the coconut oil on the affected areas of the body until it is absorbed by your skin. Wheatgrass – Contains nutrients that help to neutralize the body’s pH and prevent excess sweating. Among the many nutrients found in wheatgrass are Vitamin C, Folic Acid, protein, Vitamin B6 and Vitamin B12. 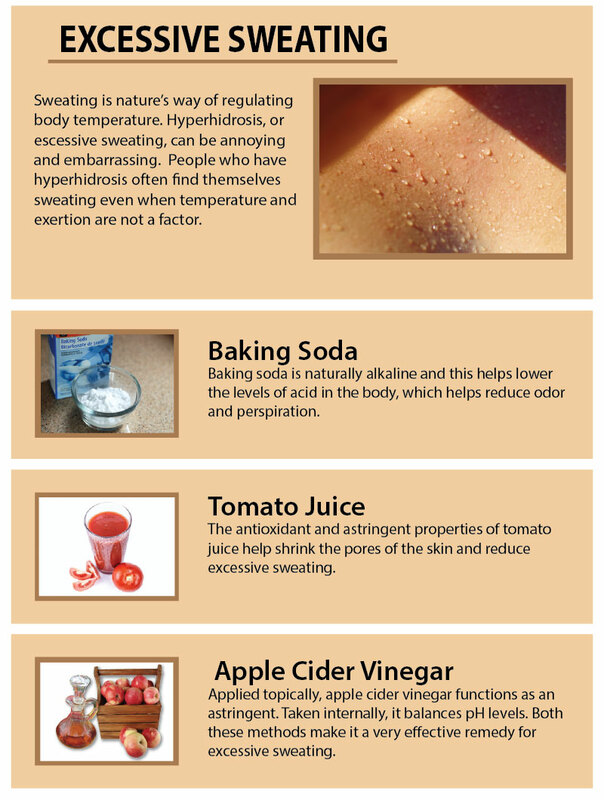 Tomato Juice – A very effective method to help hyperhidrosis because of the many healthy properties it contains. You can either purchase prepared tomato juice or prepare it yourself to make a more natural drink. Drink a glass every day. Water – Nothing can replace water when it comes to hydrating your body and overcoming excess sweating. Water gets rid of toxins in your body and even helps reduce anxiety and stress issues which can cause hyperhidrosis. Potato – The potato is a great remedy for excess sweating. It naturally balances your pH levels to reduce the amount of sweat produced by the glands. Clean the potato and cut into slices, then rub the slices on the affected areas. 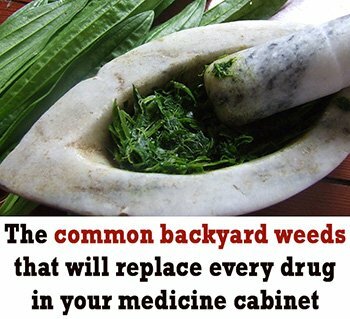 Some medications may cause excessive sweating. Blood pressure medications, antibiotics, supplements, dry mouth medications and some psychiatric drugs may trigger or exacerbate your bouts of hyperhidrosis. While sweating is desired during an intensive workout – it can be embarrassing if you’re in a meeting or on a date. There are many natural routes you can take to get reduce both the incidence and degree of hyperhidrosis, so keep trying if you don’t succeed the first time.